It all started with a whisper, though not a careless one, all the way back in 2014. Jason Aaron stripped Thor Odinson of the mighty Mjolnir with the simple sentence, “Gorr was right.” Three words that came with a hell of a lot of consequences. Not only could the blonde god we all know and love not lift the mystical hammer, but he lost his namesake. According to some, this was an affront to their devoted fandom. Others thought that maybe it was fine. “Things that happen in events don’t last that long,” we told ourselves. How wrong we were. Not only did Odinson lose his name, but he also lost an arm! May the uncalled-for torture of our favorite Asgardian never end? What is it that angered Jason Aaron so much about this character he had been writing? To be fair, asking these questions is missing the point of the story. This story isn’t about the Odinson. It’s about a simple mortal. A strong woman named Jane Foster, the former love interest of the Asgardian god whose namesake she took, was deemed worthy by Mjolnir and she wielded the hammer as an uncannily adept goddess of thunder. The hammer soared for Jane in ways it had never done before, and even Odinson was in awe. It did so because Jane formed a different type of relationship with the hammer. In the past, Thor had simply used the hammer as a weapon or a tool. He undoubtedly had respect for it, but Jane viewed Mjolnir as much more. Maybe that’s because it called to her when Odinson was no longer worthy. She heard Mjolnir’s voice in her head and was compelled to lift it and be transformed into the Mighty Thor. The question that we should be asking though is why Mjolnir called out to Jane. Why of all the other Asgardians, or characters who’ve proven their worthiness in the past, was a woman in the midst of her own battle with cancer chosen to wield all that power? That question is the strength of this entire run on The Mighty Thor. Issue after issue Jane proved why she deserved to be Thor. In reality, Mjolnir decided to call to Jane because Jason Aaron thought it was a unique idea. Then he gave that idea life, and boom we got one of the best runs on a Thor book we ever could have asked for. We should be grateful, and yet parts of the internet are still sour to the idea. If you feel that this shifting in the balance of Thor stories only happened because of an editorial push for diversity in comics, I won’t flat out disagree with you. It is probably a germ of where this idea came from. It certainly isn’t the reason this story happened, but it probably helped it come to publication. The point of the entire Mighty Thor storyline isn’t that Thor became a woman. The point is that Thor became a mortal who didn’t aspire to be a god. Let that sink in for a moment and digest it. The new Goddess of Thunder didn’t want to be a god. Jane didn’t even let the gods use their magical healing abilities to defeat her own battle with cancer. That alone is a testament to how strongly rooted in her own humanity Jane is. I’m not sure anyone facing a life-ending illness would pass up a chance to live the rest of their normal lifespan – let alone taste immortality and walk away. And yet, Jane did, leaving behind an actual sense of loss in her fellow characters and the readers who’ve been following her adventures. 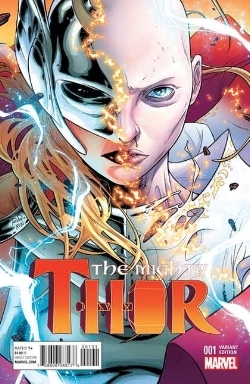 Although, this moment of her passing is not an unexpected one – Jane debuted as Thor already on the tough end of her battle with a terminal disease – because the last arc of her adventures has been titled The Death of Jane Foster for months now. We’ve been preparing ourselves for this, but it still hurts. So, let’s get back to why Jane is undeniably worthy of the title she assumed. Due to his nasty little machinations, Malekith unleashed a war that literally consumed all of the realms. All the while as the realms were caught in this inescapable carnage, Odin turned his one good eye away from the whole situation. The leader of the gods refused to come off his throne and help those who would call out for his help the most. Jane saw this and plunged herself into fighting for those who couldn’t, even as each transformation advanced her aggressive cancer’s damage to her mortal body. Jane literally gave herself to save complete strangers when the gods couldn’t be bothered to help. Well most of the gods, Volstagg did his best to help and we got the incredible War Thor out of the process. His story was both heart wrenching and exhilarating to read. I’m only sad it ended so quickly when Volstagg fell to the indomitable Mangog. The seemingly unstoppable creature with the strength of a billion billion beings – and a design that borders on ludicrous – was awakened by the war of the realms. Mangog is apparently the universe’s answer to the gods. He is their reckoning and judgement made into a single powerful being. So, as he set about on his quest to reach Asgardia and purge the universe of all of Odin’s ilk, he destroyed the ultimate version of Mjolnir, crumbled the Bifrost bridge, laid waste to the Asgardians, and sent Asgardia itself on a collision course with the sun. Then he engaged both Odinson and Odin in a brutal confrontation. Jane, having given up wielding Mjolnir to focus on her own health, had promised to leave all things Thor aside – it was determined that if she transformed into Thor one more time her mortal body would perish – realized that Thor was needed and lifted Mjolnir one last time. She knowingly gave her all to come to the rescue of Odin even when his unwillingness to act set about the events he was currently suffering. Jane then of course found a way to defeat Mangog, at the cost of her own life and apparently even that of Mjolnir’s. Thus, giving up any chance she had at continuing to live. It is important to note that as Jane fought the self-proclaimed judgement of the gods, she gave the ultimate judgement to Odinson. In the midst of her mortal battle she proclaimed, “We need gods we can believe in! Tell them that! Tell all of Asgard! Tell them it’s time to earn the gift they’ve been given!” Effectively, in her last few moments, Jane laid the ground work for Odinson to believe in not only himself, but the rest of his fellow gods, again. Odinson may have to lift a new hammer, but he will be able to do so as Thor with a fresh realization on what it means to be a god. A final gift given to him by a mighty mortal.